If there’s one thing that digital workers hate, it’s the traditional business card. It’s like, “What am I supposed to do with this archaic piece of paper? ?” In an age where we store basically everything in our phones, laptops, and tablets, the paper business card is doomed to be lost forever at the bottoms of purses and accidentally sent through the wash after being absentmindedly placed in back pockets. And yet, paper business cards seem to still rule supreme at basically any networking event you go to. What gives? Well, I’m happy to announce that I have an alternative for all of you who are sick of having to manually input contact info into your phone. 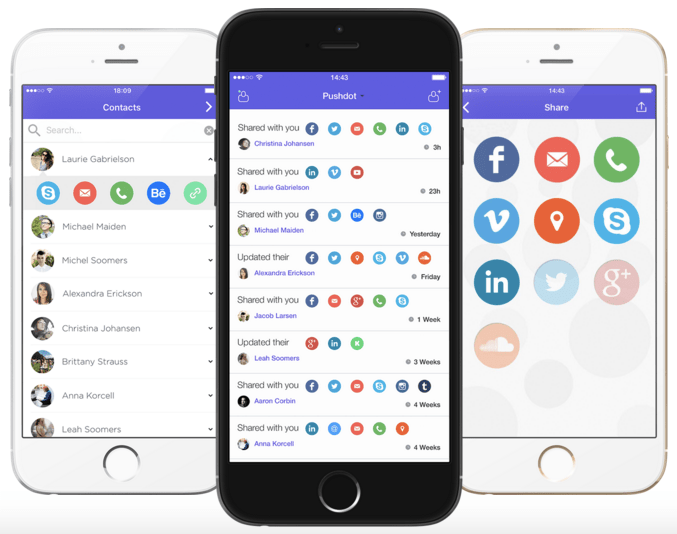 Pushdot is a new app available for iOS that makes it super simple to share contact details between phones. The app allows for all of your info to be included, from phone numbers to Facebook to email to Skype to Twitter… You get the idea. Once you put your contact information into your own app, you can choose which ones you want to share with each individual person who requests your info. That’s great because, for example, you might want that cute person you met at the bar to have your Facebook and phone number, but you’d really prefer that the CEO you met at your latest networking event only saw your LinkedIn profile, right? The app lets you see contact requests on its social stream, which is also where you can make edits to existing contacts. You can also share information with anyone, even if they don’t have the app themselves. Let’s play out a scenario in order to understand why Pushdot is so great. Imagine you’re at a high-end networking event, the kind of meetup that could introduce you to people who could really make your startup. You’re circulating, chatting, socializing, and you come across a major investor who you’d been hoping would come but were not expecting to show up. As luck would have it, he’s talking to someone you know and you join the conversation. After about five minutes of chatting, you’ve piqued the investor’s interest enough that he asks you for your email address. Instead of pulling a card out of your pocket like every other elevator-pitch spewing founder there, you whip out your phone and quickly tap on the relevant dots in Pushdot. You ask the investor for either his email or his phone number and, ding! He’s got your contact info already in his phone. Oh, and then you get to spend another additional few minutes of his precious time explaining the awesome app you just used to share your details. Who do you think he’s going to remember the next day: the guy whose paper business card is buried amongst the fifty other business cards in his wallet, or the guy whose contact info is already snugly stored in his phone? So, if you’re so done with the paper business card and are ready to start networking the 2016 way, head over to Pushdot now and take your game up to the next level.